Oct. 16, 2014, 12:27 p.m.
Police say a group of teenagers with guns roamed Harrisburg on Tuesday night, breaking into cars and robbing people. Then they messed with the wrong target. No, it’s not the plot of a Jason Statham movie — the teens tried to rob, at gunpoint, two state representatives. (This happened in the year 2014, blocks away from the Capitol building in a city in the Northeastern United States.) Instead of pulling out his wallet, Luzerne County Rep. Marty Flynn pulled out his handgun and returned fire. He and Rep. Ryan Bizzarro ran one way; police say Jamani Ellison, 17; Jyair Leonard, 15; Derek Anderson, 17; and Zha-quan McGhee, 15, ran the other. Those teens were charged with attempted homicide, conspiracy, robbery, aggravated assault, reckless endangerment, and carrying a firearm without a license. It’s the second armed holdup near the Capitol in the last week. The fountains in Dilworth Park are about to become an ice skating rink, open to the public 7 days a week. The Inquirer‘s got the details on when: On Nov. 14, the new Rothman Institute Ice Rink opens. (The Rothman got the rights to sponsor the public space; brought to you by the same idea as Jefferson Station.) The rink, about the same size as the one at Rockefeller Center, will be open from 3- 9 p.m. Monday-Thursday; 3-11 p.m. Friday; 11 a.m.-11 p.m. Saturday; and 11 a.m.-8 p.m. Sunday. WHAT: ‘Staches and Spirits, a first-ever whiskey tasting and document display showing outrageous hair (including facial variations) through history. WHERE: The Pennsylvania Historical Society, 1300 Locust St.
HOW MUCH: $25 but that includes hors d’oeuvres and whiskey, so. If you happened to notice your neighborhood patrolman wearing oddly striped socks yesterday, it was for a good cause. Philadelphia’s Ronald McDonald House asked people to show their socks today in support of the charity’s 40th anniversary and to help raise $40,000. Police, newscasters, a couple of Sixers and even a little statue of Billy Penn all flashed some red and white to help out. Of course the photos were all over social media; we’ve collected them here. Meet the men of the First Troop Philadelphia City Cavalry, described by the Wall Street Journal as “probably the most idiosyncratic unit in the U.S. military.” Why? Well, they drink. A lot. 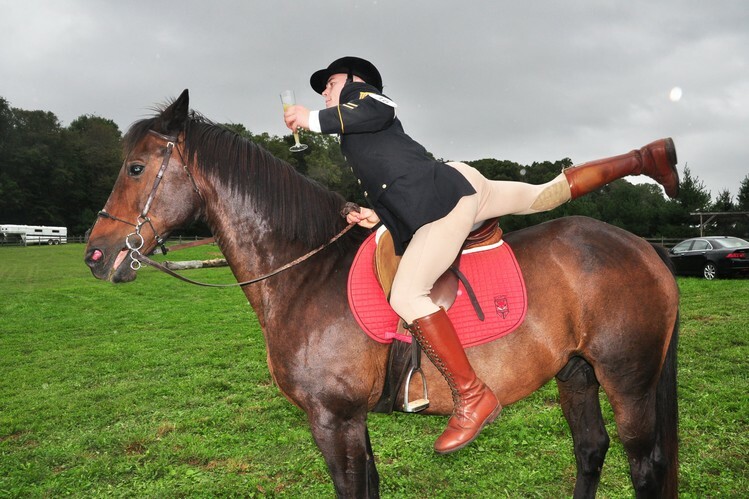 Often, as a hilarious photo shows, while on horseback. Sadly their number is dwindling; it’s hard to find bluebloods who can withstand such a rigorous schedule of boozy dinners, singing and occasional actual war. It’s a great story; you should read it.